During the day, I spent more time than is good for anyone watching proceedings in the House of Commons and took to Twitter a few times to note that her voice was going, going...and at this rate might soon be gone. By the time, hours later (above), she'd lost the vote, her voice sounded very different to what it was like at the start of her opening speech and and Philip Hammond, sitting on her left, wasn't able to rescue her with cough sweets as he'd done at a party conference when the same thing had happened (to her voice). Will she drink enough cocoa tonight to make it fit for yet another gruelling day tomorrow??? How many skiers after Paddy Ashdown resigned as leader? 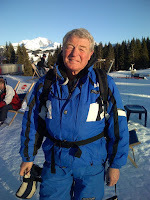 In an earlier post on 19th January), I wrote about the annual Ashdown-Atkinson ski-tours and the large number of LibDem activists - including M.P.s, peers, at least one knight and lots of ordinary members like me. 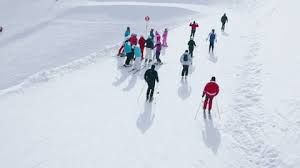 Many, if not most us, came with our families which meant that there could be as many as 20-30 of us being led down the pistes by our intrepid party leader. At one point during the 1999 trip, Paddy and I were alone on a 2-seat chair-lift together - one of the only places for a private chat on such expeditions. He told me that, as you couldn't put a cigarette-paper between his politics and Tony Blair's, he was planning to quit the party leadership later that year - "...to give a new leader at least two years to establish himself and become well-known to voters before the next general election." Although I was surprised (and less than 100% convinced by his argument), I managed not to pass his news on to anyone else, even though it became quite difficult towards the end of the holiday, after the Ashdowns and some of the others had gone home. On skiing up to a group of senior LibDems, I was greeted by "We think it's essential that Paddy leads us through the next election; what do you think." I can't remember exactly how I replied, but it was along the lines of: "I know what you mean but I suppose it's really a matter for him and Jane to decide." A few weeks later, on 20th January, he announced his intention to resign the leadership of the Liberal Democrats. By August, 1999, the party had elected Charles Kennedy as their new leader. On 27th February every year, I always think of two special men, my father and Paddy Ashdown who shared the same birthday. Then on 24th June every year, I always think of two special women with the same birthday, my mother and Jane Ashdown. For her, yesterday, on what should have been his 78th birthday, it must have been especially difficult to spend the first 27th February for 50+ years without his being there. 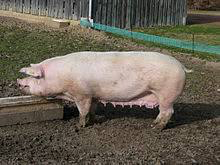 Of the many things Paddy and I used to talk about, one that might surprise people was pig-farming. When his father retired from the Indian army, he went back to Northern Ireland to run a pig-farm. My father was a mixed farmer who took special pride in his pigs which were called the Burbridge pedigree Wessex saddlebacks - one of which won the supreme championship at the Great Yorkshire Show. The only trouble with breeding what are now called 'traditional breeds' like Wessex saddlebacks was that, as he used to say, "Housewives are demanding leaner and leaner bacon which means that sooner or later we're going to have to abandon the pure saddleback in favour of crossing them with large whites or, better still get hold of some Danish Landraces, the Dachshunds of the pig world." The Danes were so aware of their good luck in having a monopoly of ultra-lean bacon pigs that they did all they could to prevent the export of live Landraces. But I digress, my father's realisation that he was going to have to go in for mass pig-production led him to Northern Ireland, where there were some pioneering pig-farmers. We went on a ferry to Belfast, where my mother had a friend whose husband was a marine engineer working at Harland and Wolf in Belfast building the aircraft carrier HMS Eagle. So in 1950, while he was inspecting pig-farms in Northern Ireland, my mother, brother and I stayed in Belfast as tourists, which included visits to Stormont and the shipyards. It would be nice to think that my father had met Paddy's father on his tour of pig-farms, but the dates mean that we must have been there there before the Ashdown family came home from India. Stanley Atkinson went to the King's School in Pontefract and would have dearly loved to have been allowed to stay on there a bit beyond than the then official school-leaving age of 14. But Grandpa Atkinson had other ideas, namely to make his own oldest child work on the farm for £0.00 a week. So, for the 16 years until he was 30 (when he married my mother in 1941), he worked six days a week for his keep + no wages. If he needed to go into a local town to buy new clothes (or anything else), he had to ask my grandmother to give him some cash. By the time he reached his twenties, his frustrated brain had led him to become actively involved in attending local WEA (Worker's Education Association) lectures and, by the time my older brother and I were born, he'd amassed large numbers of non-fiction paperbacks and biographies and was genuinely self-educated. He was also keen that his own sons would have a better education than he'd had, that they could stay at school as long as they liked and, if they passed the right exams, could go on to a university to study whatever they wanted - which is exactly what my brother and I both did. At a time when so few youngsters went to university, our good fortune as 'sons of the soil' was itself quite exceptional. Years later, after I'd become a professional sociologist, I did a survey (from memory) of the other 50 sons of farmers I'd known as a child. Apart from my brother and me, the number of others who went to a university was one - who (surprise, surprise) was a younger son, whose older brother left school at 16 to work on and eventually take over the family farm (which is exactly what the other 94% also did). For much of my childhood, Cllr. Stanley Atkinson represented Burton Salmon on the long since defunct Osgoldcross Rural District Council, of which he eventually became Chairman. Underneath our farmland were seams from a local coal mine, four miles away was a new Ferrybridge power station with chimneys and cooling towers, there was as canal and a navigable waterway (the River Aire), railways, potteries, factories and chemical works. It was, in other words, a rural district council of an area that was both urban/industrial (represented mainly by Labour trades unionists) and rural/agricultural (represented mainly by farmers). Although he knew that most voters assumed that all farmers were Tories, he always insisted on standing for the council as an Independent. If you asked him why, his answer was that tribal party politics had little or no relevance for the burning local issues on which members of the council made decisions. "If a Tory member backs a new bus-shelter for his village, Labour members will oppose it. If a Labour member wants street-lighting in theirs, the Conservatives will oppose it. But what really matters is what the local constituents actually want." He was took special pride in the fact that, while he was the village's representative, they not only got both street-lighting and a new bus shelter, but new council houses as well. Because he really was Independent Labour and Conservative councillors repeatedly elected him as their chairman. But his only attempt to graduate to the County Council was thwarted by corrupt practices elsewhere in our area where an infamous local architect with offices in Pontefract lived, namely John Poulson. When I went canvassing for my father - knocking on local doors beyond the village, distributing leaflets (for which, as an Independent, my father had paid for himself) - the standard reply to my offer to tell them more about what a brilliant job he'd done for the Osgold Cross Rural Distract council was along the lines of: "Don't bother, son - I don't want to hear about another Poulson crony like him and never vote Tory anyway!" The only political connection he ever had with Poulson were in his official capacity as a member of the Osgoldcross Rural District Council which had to deal with a planning permission application from him to build an extremely expensive and ultra-modern house in Darrington which ORDC had granted it (*see below line for reminder about the Poulson Affair - with thanks to Professor Robert Williams, University of Durham https://www.robertwilliams.co.uk/images/PDF/poulsonaffair.pdf). I realise now that I was still in my teens when I first saw that being an enlightened, rational and sensible politician is no guarantee of success. NEW INDEPENDENTS, NEW PARTY, OR AMALGAMATION WITH THE LibDems? At a time when some Labour and Tory M.P.s have left their parties to join a new independent group (see previous blogs), I found myself wondering on their birthday how Stanley Atkinson and Paddy Ashdown would have reacted to these defections. I'm fairly certain my Stanley Atkinson, as a long-committed Independent would have thoroughly approved of recent events, whereas Paddy Ashdown would have rather they'd joined the LibDems. My own view, for what it's worth, is that the new Independents and the LibDems should definitely get together about getting tgdghd, who are far from what they used to be during the Ashdown leadership. But it is still a fairly efficient party with a lot of members in every part of the UK willing and able to canvas for a party that isn't Labour or Conservative. And, without a Poulson scandal lurking in the background, it's unlikely they'd get the kind of unhelpful response that greeted me on the doorsteps when canvassing for an excellent candidate in the early 1960s. *The Poulson affair revealed a web of corrupt transactions which took place in Britain in the 1960s and 1970s and embraced dozens of councillors in numerous local authorities across the country as well as several MPs. The ensuing scandal exposed aspects of the conduct of public life which shocked and surprised many British citizens. This conduct had largely escaped the attention of both the police and the mainstream media. The Poulson Affair, if it did nothing else, helped to make claims of British assertions of superiority regarding corruption seem rather hollow. The main figures in this drama were John Poulson, an unqualified architect from Pontefract, Yorkshire, and a key associate of his, T. Dan Smith, the leader of Newcastle City Council , and although many others were involved, these two were the ones who attracted the most public and media notoriety. I used to be a BBC TV Newsnightoholic, but hardly ever watch it these days - except when there's something interesting happening in the news - like the defection of some rather sensible MPs from both the Labour and Conservative parties. One of three MPs to quit the Conservative Party says she's "really worried" the prime minister has a "problem with immigration". Anna Soubry, who now sits with the Independent Group, told Newsnight's Kirsty Wark: "The only reason why she will not agree to [continued membership of] the single market is because of free movement of people." Overnight we heard that another Labour MP, Joan Ryan had had enough of Corbyn's leadership of her party and his feeble response to anti-Semitism - and that she's has the group of 7 independents who quit the party on Monday. As a side-show, we also had to watch Derek Hatton, former 'Militant' (i.e. Labour PartyTrotskyist infiltrator who was expelled from Kinnock's party 30 years ago) being welcomed back into today's new model Labour party. 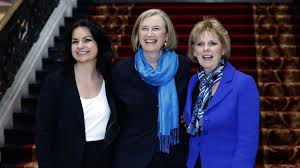 The decision of three extremely articulate and effective women MPs to leave the Conservative Party is rather more interesting than the departures from Labour - because the SDP gang of four's escape from the Labour Party's left-wing extremism was not accompanied by any Tory defections. And though the gender balance of the new Independent grouping is looking quite impressive, viewed through the eyes of an OAP, it could do with someone closer to a certain age. So who better than Soubry's neighbouring Nottinghamshire MP, than the ultra pro-European Ken Clarke??? But I suppose the big question now is whether any of the younger anti-Corbyn MPs will risk their own chances of succeeding him by resigning from the party? Andy Burnham had presumably already given up on the Corbyn-McDonnell Labour party when he resigned as Shadow Home Secretary in 2016 with intent to go back home to the North as Mayor of Greater Manchester. As I've said before, a leadership contest between David Lammy and Yvette Cooper could restore a confidence in an erstwhile credible party. Under the current regime, however, the chances of that ever happening are - er - NIL!!! Gangs of 4 and 7: history repeating itself??? The original 'gang of four', Jiang Qing, Zhang Chunqiao, Yao Kenyan and Wang Hongwenan were prominent in orchestrating Chairman Mao's cultural revolution, 1966-76. So when four leading figures in the Labour Party set up the SDP in 1981, it was hardly surprising that the media dubbed them the 'gang of four'. The reason they did so was that the January 1981 Wembley conference had committed the Labour Party to unilateral nuclear disarmament and withdrawal from the European Economic Community. They also believed that Labour had become too left-wing and had been infiltrated at constituency party level by Trotskyist factions whose views and behaviour they considered to be at odds with the Parliamentary Labour Party and Labour voters. If Militant and the far left made Labour unelectable for 17 years, Momentum looks like doing much the same to today's Corbyn-McDonnell left-wing Labour Party. The Atkinson-Kenny-Levick families have been close friends with the Ashdown family for many years and have been devastated by yesterday's sad news. Knowing that he was seriously ill was bad enough, but when someone as tough and resilient as Paddy is defeated by cancer it's depressing to the point of being almost unbelievable. The only consolations for him, but of no comfort to Jane, Kate and Simon and their families, are that he avoided being a hospital patient for too long and he avoided ever having to make the impossible (for him) decision to stop working so hard at so many different things. On a ski-holidays we always had to get up to the sound of his early-morning trumpet-call to be ready to catch the first lifts as soon as they opened at 9 a.m. sharp. One night, one of our children asked him if he always got up so early and didn't he ever sleep in and if not, why not? When pressed by the young, and to everyone's amazement, he said that he could only remember ever sleeping that late once! Paddy Ashdown's career makes you wonder if you're doing enough with your life. Born in New Delhi during the British Raj, he was at various points an MP, party leader, peer, marine, youth worker, EU High Representative in Bosnia and even a spy. He was instrumental in remaking British politics into, at the least, a two-and-a-half party system. Those involved with the short lived Social Democratic Party (SDP) had dreamed of "breaking the mould of British politics" but won only a slender number of parliamentary seats. It was Lord Ashdown's force of personality and dynamism, bringing the old Liberals and SDP together into the Liberal Democrats, which made that remoulding a reality - winning a slew of new MPs at the 1997 general election. Affable, real, always with a story up his sleeve, he connected with the British electorate. At a time where the public were to rail against "machine politicians", he stood out. Although a Liberal to his fingertips, it's no surprise that his death is being mourned by politicians from all corners of the political stage. His was an un-tribal politics, pluralist and open. He worked closely with Tony Blair in the late 1990s; had the 1997 general election produced a hung parliament or small Labour majority, there's little doubt he would have entered the cabinet. Later, Gordon Brown offered him the post of Northern Ireland Secretary in his administration. Conversely, in 2010 he would become one of the fiercest defenders of Sir Nick Clegg's decision to enter into coalition with the Conservatives. Lord Ashdown's ballast and stature within the Liberal Democrats gave Sir Nick the shield he needed to take such a momentous decision and sustain it in office. But despite all his achievements, the vim and the verve, it's hard not to conclude that the sort of politics Lord Ashdown embodied and fought for is waning. His brand of pluralism seems ill at ease in our own age of anger and hyper-tribalism. The Liberal Democrats, which he worked so hard to build, are now a rump, unable to shake the shackles of the coalition years. Liberalism itself, both in Britain and the West, is on the retreat, rocked by the advance of populism and mainstream parties morphing into more extreme echoes of themselves. And of course, Britain's place in Europe, at the centre of his politics, as an avowed pro-European, has rarely looked more uncertain. He ended his life publicly mourning what he saw as Britain's retreat from her internationalist role, her place in the post-war order in which he so fervently believed. None of that can be blamed on Lord Ashdown. Few can say they held the torch of liberalism aloft with greater force than he.Liberalism though, clearly needs a new torchbearer, one with at least some of Lord Ashdown's qualities. At present, few seem available. More essential viewing from Channel 4 News; Brexit explained: what happens when the UK leaves the EU? Having just finished reading the best selling book of 2018, Michelle Obama's Becoming, I can report that I couldn't put it down and that I'm not at all surprised it became a best seller so quickly. She writes extremely well, as you'd expect from someone educated at Ivy League universities (Princeton and Harvard). Interesting though the latter parts the book are (en route for the White House and eight years as First Lady), I didn't find it as fascinating as the story of her childhood and early life in in a tiny apartment on the South Side of Chicago. This is the story of how a bright daughter (with a bright older brother) was brought up by Fraser and Marian Robinson respectable working-class parents who devoted their lives to making sure their children had the best opportunities possible for African-American kids in a deprived area of Chicago. Craig Robinson was a brilliant basketball player who got into Princeton, and was followed there two years later by his younger sister Michelle. After graduating, she did a law degree at Harvard and was recruited to a highly paid job with good prospects at a law firm back in her home town - where she eventually met her husband. '...it was impossible to be a black kid at a mostly white school and not feel the shadow of affirmative action. You could almost read the scrutiny in the gaze of certain students and even some professors, as if they wanted to say, "I know why you're here.".... Was I here merely as part of a social experiment?' (pp. 78-9). It may not be officially categorised as a political memoir, but there are quite a lot of similarities with another excellent memoir that was published two years earlier and definitely is. 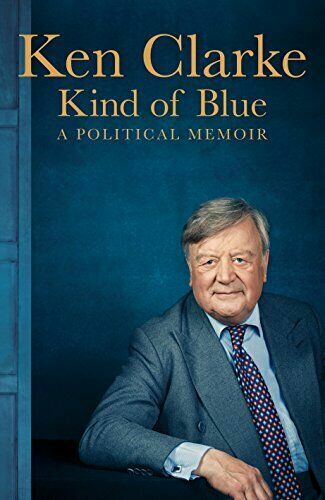 Like Mrs Obama, Ken Clarke also read law (at Cambridge, England). Unlike her, he'd become interested in politics fat an early age and one of the reasons he decided to do a degree in law was that his long-term ambition was to become a Conservative member of parliament. Working as a barrister was well known as a good training ground for anyone wanting to become a professional politician - with the added bonus of learning effective public speaking and making a comfortable living - essential in Clarke's case as, unlike many Tory MPs, he couldn't rely on any family money to support him. 'I never thought very much of politicians who make a great deal of their poor-boy origins. Nevertheless, I was bon on 2 July, 1940, impeccably working class' (p. 1).
' In Kind of Blue, Clarke charts his remarkable progress from working-class scholarship boy in Nottinghamshire to high political office and the upper echelons of both his party and of government... His position on the left of the party often led Margaret Thatcher to question his true blue credentials, and his passionate commitment to the European project has led many follow Conservatives to regard him with suspicion and cost him the leadership on no less than three occasions' (dust-cover blurb). or his own success in making the most of the opportunities available to him. Like Mrs Obama, Mr Clarke is a good writer with a good story to tell. It's another memoir I couldn't put down when I reading it. Although I've never voted Conservative, I've always had - and in these crazy days of anti-Europeanism - continue to have a lot of respect for him. I also share and/or approve of some of his alleged 'eccentricities': he's a keen cricket fan who still smokes, likes drinking Scotch and wears suede shoes. I'm not as avid a jazz fan as he is, but, as an author, I do admire the neat way in which the book's title and chapter-headings are all famous jazz tunes. These pictures of Paddy and me were taken ten years ago on the last of many ski-holidays we'd spent together since 1988, when he'd become leader of the LibDems. It was also by far the most exhausting few days I ever spent on a ski holiday - on which more after the history of the Ashdown-Atkinson ski-tours below. Very early in our friendship, we'd discovered that we both had children of a similar age, that all of us liked skiing and that our families tried to go skiing every every year. For them, the Ashdowns, weekend family skiing had been a pleasant perk of life in Geneva (between his lives in the Royal Marines marines and in politics). After Paddy became party leader, I'd book apartments for the Ashdown and Atkinson families and he'd tell friends and colleagues (including MPs, party members, officials, activists, etc.) where and when we were going that year. Some would make their own travel and accommodation arrangements, others would phone me to ask about this year's available options. During the eleven years of his leadership, many people came on these haphazardly packaged holidays. Usually there'd be 15-20 skiers (+ partners and younger children who might or might not be old enough/good enough skiers to follow the leader). "Follow me to the first lift - no matter how cold it is!" Those wanting to ski with the group in the morning knew that they'd have to be at the first lift as soon as it opened at 9.00 am. Anyone in or near the Ashdown apartment also knew that they'd have been woken up at 'sparrows' fart' (Ashdown family jargon for 'crack of dawn') by the sound of our leader's loud imitation of the military reveille WAKE UP! bugle call - after which there'd be no chance of ever missing the first lift. Once on the slopes, there was no need to think any more, as it was a matter of 'follow my leader' - who allowed for the fact that it was often a mixed ability group that he was leading. So the route he selected would be reasonably gentle and reasonably free from other skiers. After a few hundred yards, he'd stop and wait for everyone to catch up in as safe a place as possible. More follow my leader down the slope and however many more catch up/rest/gossip interludes were deemed necessary before reaching the next lift queue, followed by a longer and more relaxing rest on a chair-lift. During the days, there'd be occasional breaks for coffee or beer at mountain restaurants but we were then left to fend for ourselves from about 12.30 hrs to 14.00 hrs. Paddy, Kate and Simon went back to their flat, where Jane would have cooked them a wholesome lunch. In his skiing Paddy managed, as in all other aspects of his life, to be thoroughly focused, thoroughly considerate and thoroughly pleasant. Q: Why was this the most exhausting few days skiing I have ever done? A: Because Paddy and I were the only two skiers in a house-party of four: Jane and Joey had long since given up skiing and were quite happy relaxing in the chalet and wandering around the village. Having skied many times with my son and family, mainly in Les Arcs, I'd discovered that there was much to be said for NOT getting to the first lift as soon as it opened at 9 o'clock. Later on in the day, snow gets softer and less icy - and, if the sun comes out, it gets even easier to ski as the day wears on. In blizzard conditions and/or if it's too cold and icy, you can just mooch around bars and restaurants. On this particular holiday, I obviously couldn't avoid Paddy's early morning bugle call and the first challenge of the day (for a leisure skier like me) was to delay our departure for as long as possible after breakfast - which I succeeded in doing on most days. Fit and healthy though he always looked, Paddy had suffered for many years from a painful condition he never talked about in public (gout in one of his legs), a condition that made the laborious business of getting a heavy ski-boot on even more laborious (and painful) than usual. So it was a real help having someone there who was willing and able to help. Having spent a few minutes helping him with his wooly socks and cramming his foot into the boot, I'd an excuse to take many more minutes pretending that there was something wrong with my own boots - which bought me enough time to delay our departure until 10 o'clock). Once on the slopes, there was little chance to stop for a rest and I had to spend the whole day trying to keep up up with him with few chances to stop for breaks. What made it worse was that the resort seemed to have more drag-lifts than chair-lifts, so I couldn't even sit down, have a chat and rest between the different pistes. The pictures of us at the top of the blog were taken on one such day when (after much nagging from me) he agreed to stop for a coffee - not in a restaurant or bar with seats, but standing in the fresh air at a table poking out of the snow on a stick. A quick coffee each and we were off again. As on Ashdown Tours, he always selected the routes and led the way. But with only two to think about, he stopped far less frequently and for much shorter periods than when there was a big gang skiing behind him. Reaching him wasn't a cue for a short rest, but more like firing the starting gun for Mr Boundless-Energy to be off again. That's why these were the most exhausting few days I ever spent on a ski holiday. Though two years younger than Paddy, I knew him to be much fitter, stronger and a better skier than I was. Managing to keep up with him on these exhausting days therefore gave me a real sense of achievement. The death of a spouse, father, mother, close relation or close friend is always an awful experience for those who survive them. And, having lost every one in this list, I think I may be a bit more expert on experiencing grief than a lot of people. My first wife died from sudden heart attack after supper one night in April 1992 when we were both quite young (48). But I was lucky that someone who came to her funeral in Oxford was also one of her best friends, whom we'd known in Lancaster 20 years earlier - when we'd all had small children. She and my wife had stayed in close touch and I knew that she was about to be divorced. By the end of 1993, we had started living together and were married four years later. Since then, the number of deaths among our relations and friends (young and old, sudden and expected) grew dramatically. Now in our seventies, we find ourselves going to more and more funerals of close friends and neighbours. 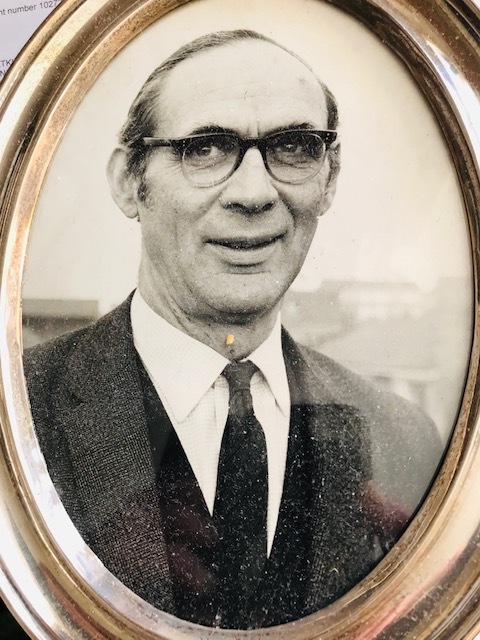 Among the many other friends who came to my first wife's funeral were Paddy and Jane Ashdown, who (typically) had a practical and generous plan to help me and my younger son in the immediate aftermath of his mother's death. Thrusting keys into my hand they said "These are keys to our house in Burgundy. We're going there at Easter. But you know where it is so you and Joe can go there whenever you like and we'll join you later." So that's exactly what we did. I had written and organised every last detail of Moira's farewell at the Oxford crematorium. And, although I'd worked with Paddy on loads of speeches, I was very flattered when he said (at the wake in our local pub) "I want a funeral like that" to which I replied that it was the first one I'd ever written and I hoped I wouldn't have to write his. We'd known that Paddy had bladder cancer since October last year and that he was being seen by specialists Southmead Hospital in Bristol. When he was eventually admitted there, he was his usual cheerful, bouncy, Tiggerish and optimistic self. A senior nurse who was going to be looking after him (and also happens to be the daughter of neighbours of ours) told us that, before actually meeting him, she was a bit nervous about meeting him - and what she should call such a famous peer of the realm. She needn't have worried. Before she'd time to tell him her name, he was on his feet holding out his hand to shake hers with the words: "I'm Paddy!" which immediately put her at her ease. pneumonia. He'd never looked like an elderly man, nor would he have considered 77 to be on the outer fringes of fogeydom. But my medical relations (two GPs and two nurses) tell me that the older we get, the more vulnerable we become to illnesses from which younger people would recover more easily.